By their looks, the Steamers resemble humans. Considering their biology, they are humans in fact. They differ from humans not in their posture but in their attire. In desert South, male Steamers wear trouser with bracers, shirts, hats, leather jackets and riding boots. The wealthy, such as industrialists, follow the Northern fashion. Then, shirts or corsets, skirts, boots on broad heels, and hats are intended for females. In the North, typical male attire consists of trousers, shirt, waistcoat and jacket. On cold days, longs coats are used. 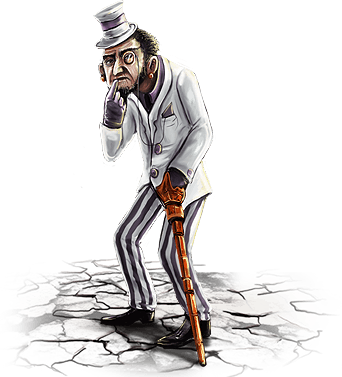 A bowler-hat and a walking stick are welcome, considered attributes of a gentleman. Females may enjoy ample dresses, costume jackets, broad hats. A female not wearing a corset is considered eccentric. Attire of the lower classes is simpler the that of the aristocracy. An ordinary workman wears a shabby jacket, knee-patched trousers, and a shirt made of cheaper cloth. An ordinary workwoman prefers comfort to elegance (a simple haircut, a skirt instead of a dress). A female wearing a male's garb is frowned upon. Only the most courageous and the richest females may indulge in such extravagance. Every one of the Steamers should know their place in the society, assigned by their birth, education and wealth. In their class, the Steamers have specified rights and obligations, regulated by the Empire's law. The Steamers society consists of the following classes: farmers and workers, middle class (including traders, industrialists, scientists and intellectuals), and aristocracy being the highest class. A possibility to change social class does exist. Any person having an adequate wealth or education and able to distinguish themselves, may become a member of the middle class. Aristocracy however, is accessible only by marriage. Life of the Steamers is governed by etiquette, but it pertains only to aristocracy and middle class. The poor observe its rules only when they want to get into favor or distinguish themselves. Among the Steamers, emblems are very important. Every university, school, town or noble house has a crest. Military squads use emblems defining their type or referring to historical events. Aristocracy and great scholars sign all documents and letters in characteristic ways. Lower classes tolerate scientific creations only to a limited extent. They accept artificial limbs, however more intense meddling with the body meets with their distrust or even hostility. Higher classes are more open to changes, however they also frown upon scholars with "too vivid imagination". The state is ruled by the Emperor, a representative of the oldest and most respected aristocratic family. His will is the law. The Empire is divided into several dozen counties. A county is governed by a steward belonging to aristocracy. Stewards are appointed by the Cabinet, and approved by the Emperor. A steward has often a general at their disposal. Apart from the counties, there are also industrial zones, and agricultural and scientific areas – the latter intended for research and tests. Northern counties differ from the Southern ones by degree of their development, climate, and mentality of inhabitants. The North is highly industrialized, while the South preserved a typical rural character. Large fraction of the Empire territory is damaged. The soil produces a sufficient amount of food, however it is hard to find larger patches of forests or undisturbed landscapes. The mountains have been mostly stripped of natural resources. These are the effects of rapid economical development, which is somewhat wasteful. At present, the Steamers are the most technologically advanced race of the known world. 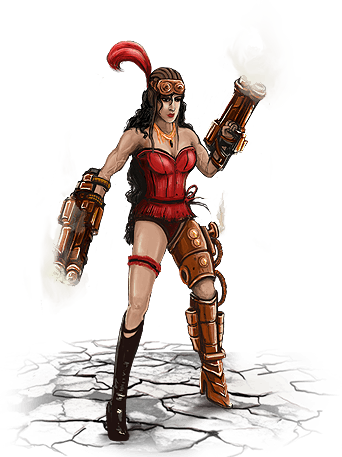 Where others exploit muscles, the Steamers use mechanisms that are a certain counterbalance for commonly used magic. All technology of the Steamers is based on steam power. Steam propels their machines, exoskeletons, land and air vehicles. The Steamers have also long range weapons. 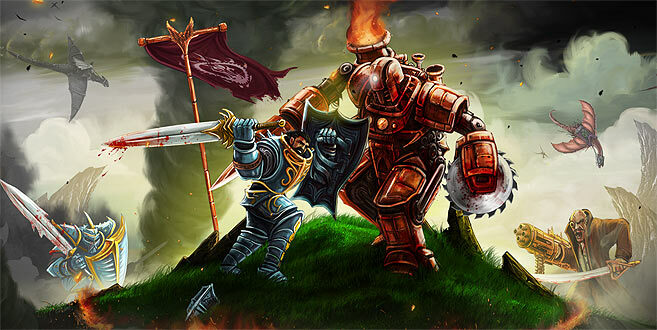 But in spite of such great possibilities, they also use cold steel and heavy armors. Only methods of their production and their parameters were improved, thanks to, among other, new metal alloys. Technology is commonly used in everyday life. Ordinary people have access to railways, cameras, printed newspapers, firearms, telegraph and other inventions. They are wholly natural for them. Northern part of the country consists mostly of industrial and academic cities, dominated by factories, large university buildings and palaces of aristocracy. Somewhere between these giants, small worker houses are wedged in. In the South, there are mainly mining towns, agricultural and animal husbandry villages. One may also often run across post stations, serving locations outside the reach of the railway that connects all Northern cities and some of the largest towns in the South. The Society is an important political power in the Empire. 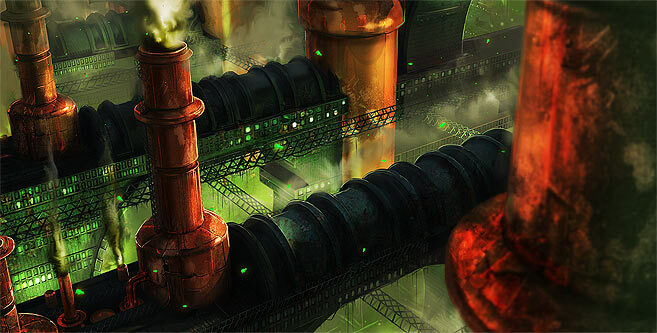 It has most of the research labs and factories in its care. The Society controls state of the research and progress of projects, and it supports the most promising young scholars. Its members have both knowledge granting prestige and esteem, and reliable financial funds for their activities. The Society has several smaller, secret subdivisions. One of them is engaged in studies of magic, treated as an "arcane technology," and tries to understand it. Aims of the other ones include searching for and exploration of ruins of the Ancients or studies which seem hideous to ordinary people (first attempts to unite flesh and metal, organ transplantation). Among these groups, there is one knowable: Explorers Association, which ventures into dangerous regions for the sake of their research. In recent years, Tamrel Island is an example of such region. Lands of the Steamers consists mostly of deserts or dead, impoverished forests and plains. The Steamers actively seek for new arable land, as well as new deposits of natural resources. For this reason, they took an interest in territories of their neighbors. Moreover, their authorities consider peoples living outside the Empire "inferior races" that should be enslaved and "developed for their own good". However, such theories are not proclaimed openly. The Humans are a target for the Steamers because of their land. The Echoes are another target, because they possess valuable destructive dragons and vast knowledge of magic.